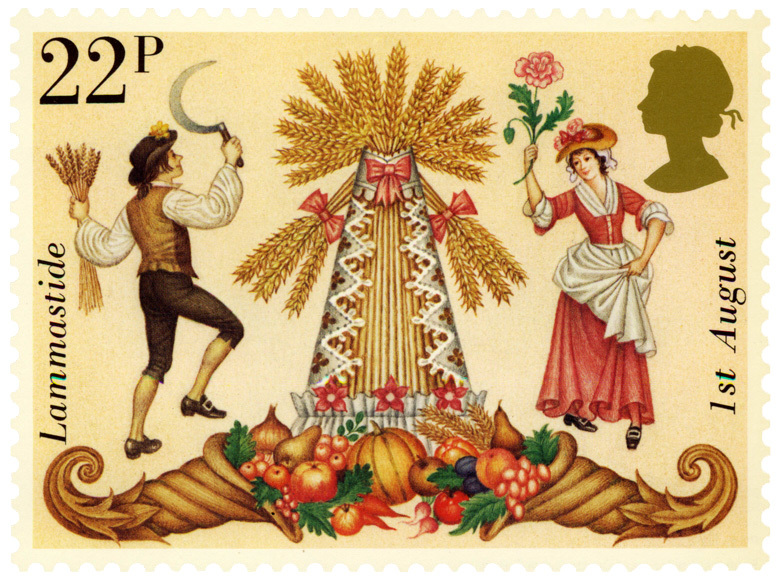 And so with this first day of August we welcome Lammas, the old festival of the first harvest. 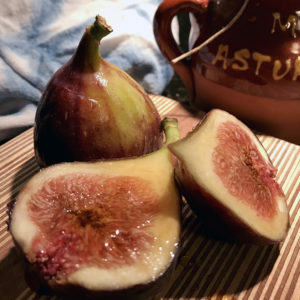 Summer’s bounty is ripening all around us, and even here in Florida, where we grow things at a schedule mostly topsy-turvy from the rest of the country (our vegetable growing season begins next month, in September) there are usually figs ripening on the trees about now. When I was much younger than I am now, one of our neighbors had a fig tree. They also happened to be snowbirds: they spent the winters in Lighthouse Point, where we lived year round, but they went to New York for the summers. Which meant their figs would be left for the birds if we didn’t gather them ourselves, and so we ate many figs in Augusts gone by. Now we get them at the market, and that’s good, too. I love them quartered or halved and drizzled with honey, a taste the very essence of late summer. We got our first ones just this week, and so it seemed right that our cover star for your Convivio Book of Days calendar for August should be that humble and delicious fig. These are Brown Turkey figs, though I am waiting patiently for my favorites, the white varieties: Kadota and Calimyrna. Perhaps this year I’ll finally poach fresh figs in wine, one of the recipes I’ve been pondering for many summers now. As for the calendar, it is printable on standard US Letter size paper, and is a nice companion to the blog. If all goes well, I will write in the blog about most of these August red letter days. But my goal this month is also to complete the proposal for what I hope will be the “real book” version of the Convivio Book of Days. A blog is good, but I am an ink-and-paper person, a man who loves books. I realized that a few weeks back when I found an old 19th century book I had remembered reading years ago: Observations on Popular Antiquities by John Brand. I found it in the university library, and I checked it out. It was the first library book I’ve checked out in a long while, and it felt good to do so. The librarian handed me the book and told me when it was due, and I left with this wonderful gift and got some lunch and sat to eat and opened my book and traveled to 19th century England. The figs drizzled in honey and the old book borrowed from a library both called to mind for me the words that Richard Wilbur used to title a poem: “Love calls us to the things of this world.” As summer begins its certain transition to autumn this Lammastide, this is what I think of. I wish you these good things, too, and everything else that means much to you this late summertime. July is ending, August beginning. And with this last night of July, the wheel of the year shifts another cog and we enter, by traditional reckoning of time, autumn. The shift can be thought of as gradual, as it is. Summer’s heat will persist for many more weeks, especially here in Lake Worth. But the change is undeniable: days have been steadily growing shorter since the June solstice, and here, at this juncture, July shifting into August, we find ourselves nearing the halfway point between that solstice of Midsummer and the upcoming autumnal equinox in September. This cross-quarter day on the First of August is known as Lammas (or Lughnasadh (LOO-na-sa) in the Celtic tradition). It is perhaps the least celebrated of the old cross-quarter celebrations, and that is too bad. It is the first of the harvest festivals, and on this day it is traditional to enjoy the things of that harvest: to bake bread and to partake of the more spirited things that emerge from the grain that gives us bread: a bit of ale or whisky. The name John Barleycorn is one you may hear these Lammastide days. It comes from many an old song praising the personification of ale and whisky. Some are sad and some are jolly, but all understand that John Barleycorn must die in order to be born again in the form of bread and alcohol. (Well, to be honest, the folks singing these songs weren’t much concerned about the bread. They are old drinking songs, after all.) John Barleycorn is that sacrificial first harvest. William Shakespeare understood this well, perhaps because Lammas was a widely celebrated holiday in his time, and in Romeo and Juliet, Juliet, we learn, was born at Lammastide, on the 31st of July. “On Lammas Eve at night shall she be fourteen,” says her nursemaid in the first act of the play. The action all takes place in these last few days of July, and poor Juliet never makes it to that birthday; she, too, is like a sacrificial first harvest. Lammastide marks for us the subtle transition of summer to autumn, and this is the value of Lammas. A holiday certainly of our agrarian past, but so useful for us today. A gentle coaxing, an acknowledgment of our days growing shorter and darker, and a hint of bounties to come. If you can bake a loaf of bread in the next day or two, wonderful: do so, and take delight in that. A crusty loaf from your local baker would do just as fine. 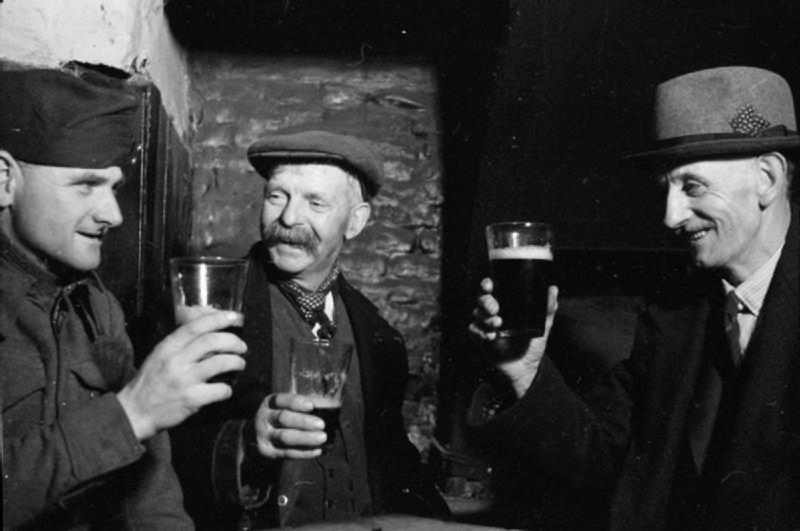 And if you can pour a little something tonight, which is Lammas Eve, or tomorrow on Lammas itself, a little bit o’ the spirit of John B., you’d do well to raise your glass and toast Mr. Barleycorn and drink to the health of those you know and love. Photo: Mark Fuller (center) and George Wickens (right) enjoy a pint at the Tiger Inn, Sussex, with a Canadian soldier on leave in the village. 1943 [Public domain] via Wikimedia Commons. Were there some drinking songs sung that night, perhaps to John Barleycorn? I don’t know. But I hope so.